The medical world is evolving at the speed of life and hospital software is going along for the ride. With the right software, hospitals across the country are streamlining their daily processes and making life easier for staffers and their patients. Technology and the enhancement of hospital-friendly software create a more efficient medical environment. If your hospital is reluctant to adopt new forms of medical software for fear of the unknown, it’s time to change your mindset. Whether it is software that helps you better track the progress of your patients or a program that puts your staff on the same page, software is helping to improve and streamline the medical practice. As long as your hospital is properly equipped and your staff is trained in the new technology, medical software will make a vast improvement on your hospital and the medical practice as a whole. Your patients are your hospital’s top priority, which is why it’s so important to track their medical progress closely. Misdiagnoses and repetitive unsuccessful treatments for the same illness simply won’t win the health battle. Luckily, electronic health records (EHR) software is helping doctors, nurses, and staff keep better track of patients. EHR can assist your hospital with managing patient documents and files, medications, lab test results, and diagnoses. With EHR, your hospital will have up to date information on each one of its patients. As the following article “RCM Software: Time to plug those revenue leaks” shows, such software can be a great tool in today’s technological world to make sure information does not slip through the cracks. Hospitals aren’t charities and if your facility isn’t on top of its finances, it could spell trouble. Revenue cycle management (RCM) software is specifically designed to manage your hospital’s patient-to-pay cycle. With RCM software, your hospital can track billing, co-pay collections, coding, and other financial areas. In addition, RCM allows your hospital to automatically manage claim errors, cash flow, and accounts receivable data. When it comes to the daily operations of your hospital, it’s important to make sure all departments are working in unison. Besides, when there’s a lack in communication between one or two departments, it can affect the way your entire hospital functions. 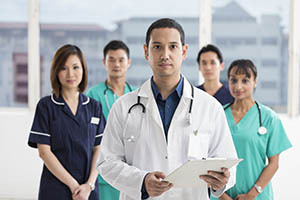 Medical practice management software can help the various departments within your hospital communicate and work together. From appointment scheduling to billing to capturing and tracking patient information, practice management software can help your hospital run more efficiently. Your hospital’s staff is constantly on the move, so it’s important to make sure they can take patient information with them wherever they go. Most of the software mentioned above has an on the go component in the form of mobile apps. When equipped with mobile devices such as tablets, doctors, nurses, and the rest of your hospital’s staff can make updates and additions to software programs in the moment and on the go. This type of accessibility takes efficiency to a whole new level. With the right medical software, your hospital’s operations will receive a clean bill of health. About the Author: Adam Groff is a freelance writer and creator of content. He writes on a variety of topics including personal health and technology.